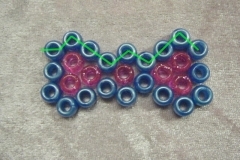 Learn to make a stylish kandi hair bow step by step with this easy to follow picture tutorial. If pictures aren’t your thing worry not, there’s a video too! The skeleton is the basis of a peyote stitch. 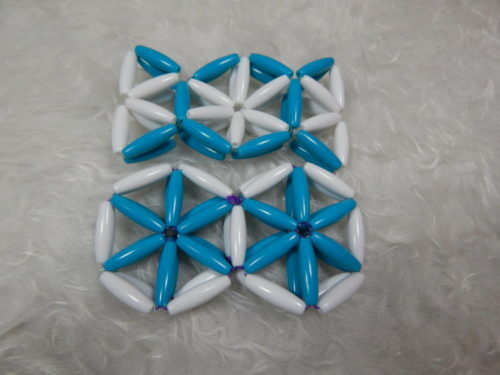 You alternate stringing on two beads and one bead. Follow each picture step. If you get confused I’ve attached a diagram with the beading pattern on it. Tie a regular square knot and loop through the last bead you strung on. We are now going to alternate between adding beads on and threading the string through the previous row to keep them in place. Add another bead and string through the last bead you strung on. 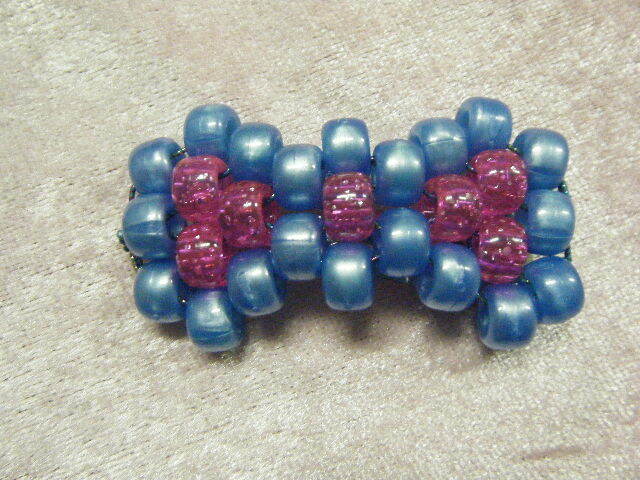 Continue beading until you come to the end of this row. We will now start to create the points. You are only going to string on two beads this row. To hide the string we will string it through the middle 5 beads before we add the second bead in the row. Loop your string to the bottom and string it through the last outside bead. Continue exactly how you made the top points. To attach the hair clip I tired the excess string around three points. Two at the bigger end and one around the point. I did not tie it around the middle prong because when you put it in your hair it can slide off the end. There are several ways to tie it this is the way I’ve found to be most effective. In case you need some extra help here is a video to help explain further. You’ve now completed your first kandi hair bow! If you have any questions feel free to leave me a comment below. Hope you guys enjoyed this video! 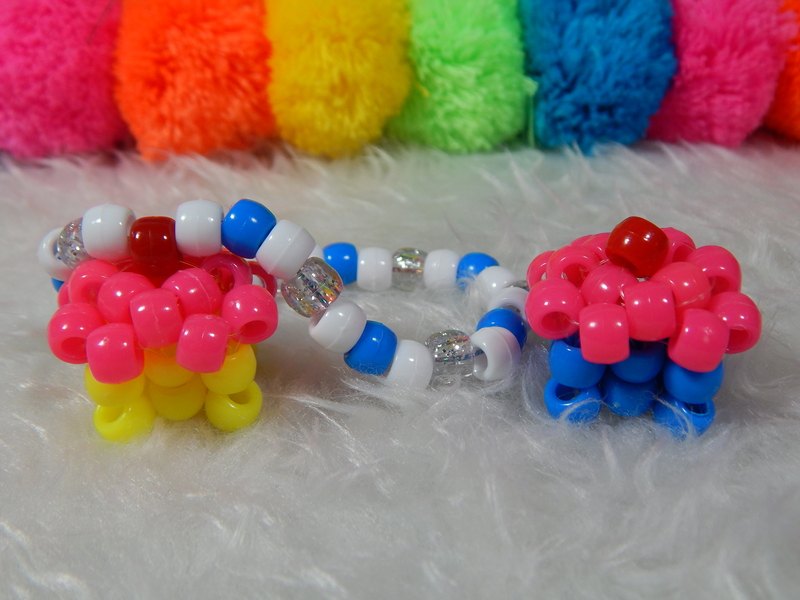 Please make sure to come back and check out what other awesome kandi related projects I have in store for you! If you make anything from this tutorial make sure to tag me in the post on instagram and I may share it in a future video! 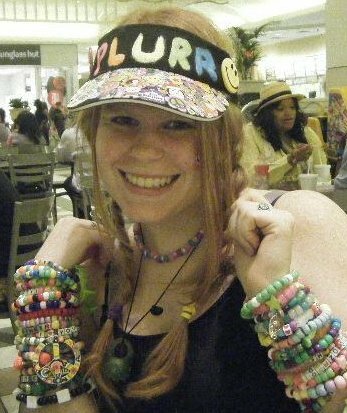 My name is Ginger and I’m an energetic kandi kid from Houston, Texas who now resides in Dayton, Ohio. 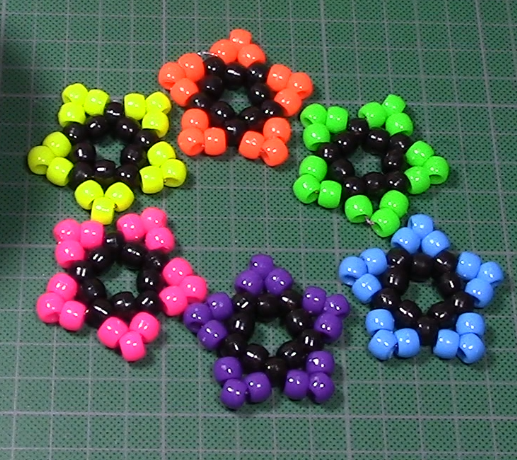 I make kandi tutorials and rave advice videos every week. Want to learn more about kandi, EDM, and raves? Hit the subscribe button to get all of my new videos delivered directly to your homepage. Thanks so much for watching, reading, and subscribing! KANDI STATION – Meet me and make kandi at EDMF Oho on 7/14/2017 from 4pm – 12pm at The Land of Illusion in Middletown, Ohio. 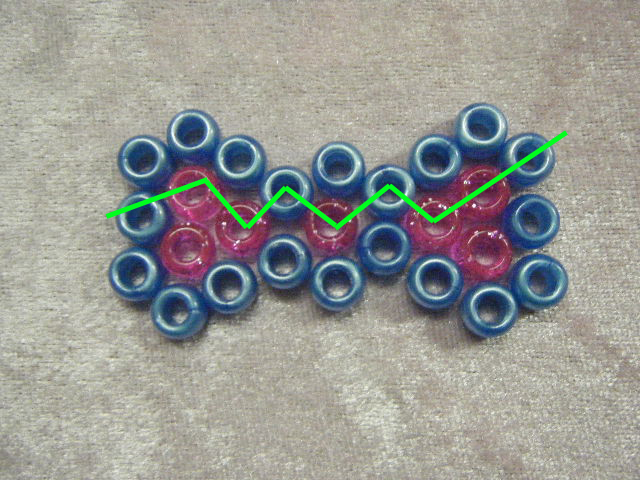 Copyright © 2019 Ginger Cand-e’s Kandi Tutorials. All rights reserved.